Heat pressing vinyl onto apparel is a fun and a somewhat easy task once you know how to properly use your heat press and the vinyl. All heat press machines and vinyl’s are different, so it is best to test out a strip of your vinyl on one of your garments, before beginning your job or project. The biggest mistake for most is that they either do not apply enough heat time to the transfer or they apply to much. Lay your vinyl transfer image side up on a flat surface. Careful remove the clear backing with an X-acto knife; you should peel off all the remaining vinyl, so all that you have left is your design. Set your heat press to the right temperature…again this depends on your vinyl and garment. Lay out your shirt on the heat press, so that the space you are planning on placing your vinyl is side up and ensure that your garment is smooth/wrinkle free. Before the graphic gets placed on the shirt preheat the shirt for a few seconds to remove any water that the garment may have absorbed. Place the vinyl transfer, backing side up on top of the garment. 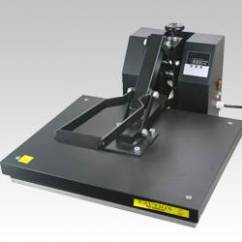 Lower the heat press and leave it there the amount of seconds dependent on your vinyl. Lift the heat press and depending on the vinyl you may want to remove the backing right away or wait for the garment to cool down first then remove. Take a towel or a shirt and rub the transfer lightly, this will ensure that the transfer remains in contact with the shirt and will assist in transfering the heat from the graphic. Contact us or leave us a comment with any questions here at McLogan.